Bucklers became common as a companion weapon in hand-to-hand combat during the Medieval and Renaissance periods. Shields like this Medieval Knight Crusader Buckler were useful in deflecting blows and binding arms of opponents. This shield is constructed of stainless steel and features a central rim and boss. Steel rivets secure the boss and a brass Crusader cross with four golden fleur-de-lis complete the look in the center of this brown defense. There is a chain on the back for wall hanging. 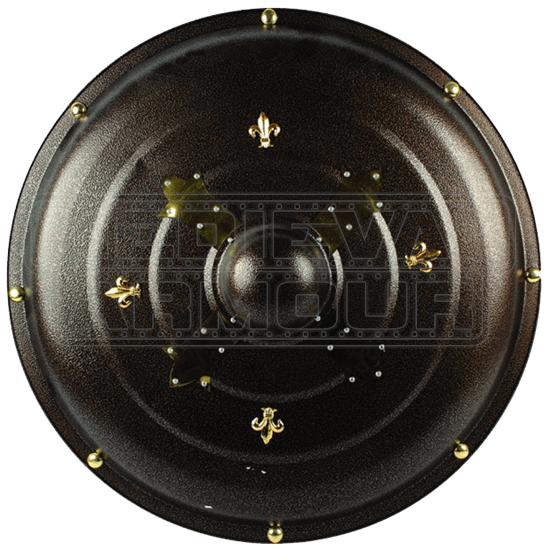 This shield is the perfect way to complete a medieval swordsman costume and looks great as a display piece in any home or office.